It was the transmission of an episode of Channel Four's Grand Designs in 2004, featuring pensioners Greta and David Iredale, that turned the tide of Huf Haus's fortunes in Britain. 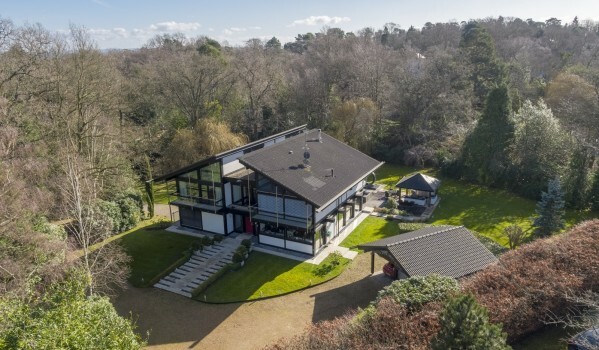 The family business, now in its third generation, has been designing these strikingly contemporary-looking homes since the early 1970s, but sales really spiked after an appearance on the popular property show. "For the first two to three years we were just building a few houses a year here and there," says Afra Bindwald, Huf Haus' business development manager. "Our server crashed 10 minutes after the programme ended, and we had to move to larger offices to deal with the influx of enquiries. It was phenomenal." Huf Haus has always been energy efficient, but the homes are now close to zero carbon, and over 200 of them have been built in the UK. "People in this country now really appreciate that there's more than the conventional build," Bindwald says. "Initially they wonder if it's going to be like living in a goldfish bowl. But they soon change their minds when they look around the show home. You should see the smiles on their faces." But that doesn't mean that we can expect to see a Huf Haus on every street corner. Bindwald says: "We only build 200 houses a year worldwide. We could have expanded, but we decided not to. It's a niche market and we want it to stay like that." What makes Huf Haus so special? Huf Haus is, essentially, a kit house. But each one is individually designed by the owner with a Huf Haus architect, then the whole thing is prefabricated to the client's exact specifications in the state-of-the-art Huf Haus factories near Bonn in Germany. The houses come in varying shapes and sizes (a small Huf Haus is typically 2,500 sq ft, while a large one comes in at 6,000 sq ft), but the uniting factor is Huf Haus's signature post and beam design, which means no load-bearing walls. There's no necessary room division, allowing owners to create a home that meets their current needs, and which can be altered later if their lifestyle changes. And the outside is important too. Huf Haus prides itself on adapting houses to the landscape in which they stand, bringing the outside in through the wall-to-ceiling glazing, balconies and roof terraces. Huf Haus has always been energy efficient and is striving to be close to zero carbon. With triple glazing that is more energy efficient than most walls, electricity generated through solar voltaic panels on the roof, and heat derived through ground or air source pumps, owners can wave goodbye to gas and electricity bills. How do you get a Huf Haus? Firstly, Huf Haus is not for self-builders. It provides the architects, designers, planners, builders, even finance. All you have to do is find a plot, get in touch with Huf Haus, and choose what you want. "We're pretty quick," says Bindwald. "I've seen conventional builders take nine months to a year to put up a house, but it can be more. A Huf Haus will take a week to be water tight, then a further 12 to 14 weeks for the internal fit out. "Before that, there's usually six months of design and waiting to get planning permission. And another six months for production and assembly on site, so it's around 12 months in total." "If you're looking at the high end, it's about £200 per sq ft," says Bindwald. "In comparison, for a conventional build, you will usually pay £150 to £170, but that won't include the architect, planners, quantity surveyors, structural engineers and the basic fit out." One huge advantage for those without limitless resources is that Huf Haus can give you an exact costing at the start of the project, which - exchange rate notwithstanding - it can guarantee will not change. The only danger seems to be when buyers visit the German factory to choose their interiors, and are tempted by luxury fittings that come as an extra over the standard package. 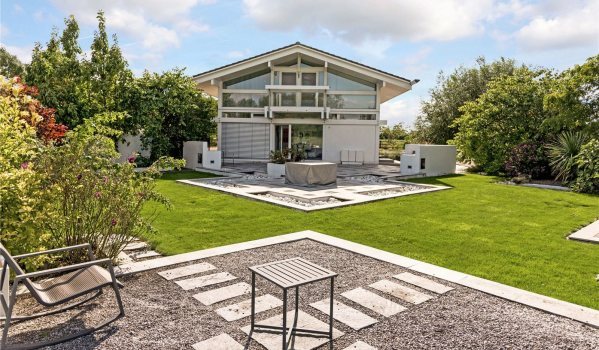 However, even if you do blow your budget on an irresistible kitchen, a Huf Haus is, according to Bindwald, a good investment, re-selling at 25 to 30 per cent above the price of conventional builds. Perhaps the most famous British Huf Haus owners are Grand Designs' royalty Greta and David Iredale, whose 2003 build was enjoyed by the nation. 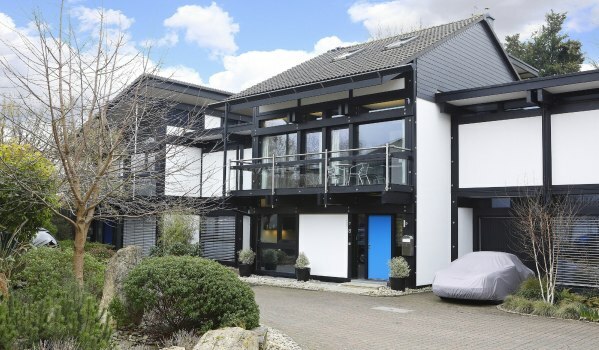 Seasoned self-builders, they were thinking about replacing the timber home that they had designed and built themselves on their Walton on Thames site when a friend told them about Huf Haus. "I remember it clearly. He came rushing up to us in the garden and said he had seen a fabulous house and he had made an appointment for us to have a look," Greta says. "And when we saw it we were blown away. We were just enchanted. It was perfect because we couldn't have done a self-build at our age, and with Huf Haus you don't do any of the physical work." The couple then spent two days at the factory in Germany finalising details and choosing fittings. "It was the hardest couple of days' work in our lives." says Greta. "They got out huge catalogues and threw thousands of questions at us. We thought we had it all planned, but we had to work out everything, down to where all the light switches and the plug sockets went. But they do guide you, and fine tune it all. "It's like Christmas out there. They have the standard and the deluxe choice, and it's easy to get carried away. But then they give you your quotation and you fall off your chair, and you go back and make changes." With typical joie de vivre, the couple made the most of the building experience. "The house went up in three and a half days, glazed, tiled and everything. But we lived in a caravan for five or six months, and we loved it - it was great fun. We were busy all the time, and we were lucky that we had a good summer." And has the finished house lived up to their expectations? "Every time I come up the drive, I can't believe it's ours," says Iredale. "It still takes my breath away. It's so peaceful and comfortable, and never too cold in winter nor too hot in summer. "People say there's an atmosphere and I think it's the fact that they check every nook and cranny to make sure there are no draughts. "And, in seven years nothing has gone wrong. They come round every two to three years to see if it needs painting and each time they've said nothing needs doing - although it would mean paid work for them. "We'd love to do it again, but at 81 and 78 it would be the moving out of furniture and putting it back in that we couldn't face."